In our commitment to help you make the right choices for your baby, we reviewed 5 diaper brands available in the market today. These products were then assessed based on their ability to keep baby dry, overall feel on the skin, and their affordability until we finally picked what we think is the best diaper for sensitive skin. For a product that uses cloth-like materials, choose Earth’s Best’s Chlorine Free Diapers. It is highly absorbent, non-toxic, and has stretchable tabs allowing baby to explore and move freely. The Bamboo Disposable Diapers by Andy Pandy are eco-friendly and are of biodegradable bamboo. It also features a wetness indicator that tells whether it’s already changing time or not. Naty by Nature Babycare’s Eco-Diapers are breathable and made from renewable materials. It is also free from any fragrances and chlorine. 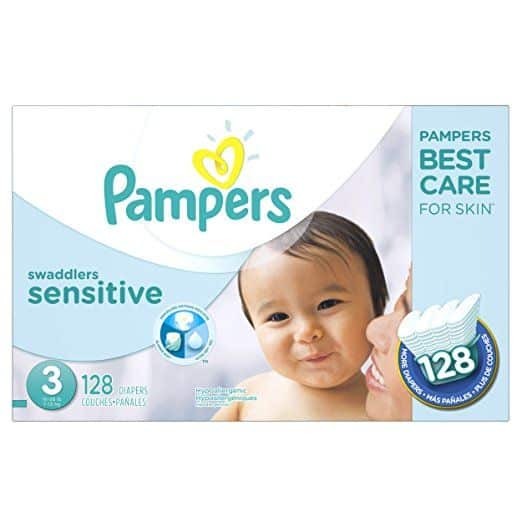 Go for the Swaddlers Sensitive by Pampers for a product as soft as a blanket. It also features a wetness indicator, and has a contoured notch for baby’s umbilical cord. Seventh Generation’s Free & Clear Baby Diapers have a highly-absorbent core and made from sustainable materials. They also come with animal prints to make diaper time more enjoyable. This is the best diaper for sensitive skin because it is hypoallergenic and is highly-absorbent. It also has stretchable tabs to let baby wander around freely and comfortably. Additionally, these diapers come with refastenable grip tabs to provide the best fit and make checking and changing a lot easier. These diapers use renewable materials like wheat and corn to minimize using petrochemicals. It is also made from chlorine-free pulps to ensure nothing dangerous gets released into nature. Lesser petrochemicals mean reducing the environmental footprint of your baby. So while being safe for your little one, you are protecting the environment as well. These diapers come with closures that are Velcro-like, which make them easy to use. They also come with moisture barrier cuffs to prevent leakage and breathable sides to prevent rashes. Best of all, these diapers come in seven different sizes. This means that there’s a size no matter how big or slim your baby is, and as he continues to grow, there’s definitely a size made for him. Hypoallergenic, this antibacterial and eco-friendly product only uses high quality materials to suit baby’s skin. It is also very absorbent and strong, since it’s made from biodegradable bamboo. Made from renewable materials, this product is gentle on baby’s skin and on the environment. Its back sheet is made from 100% bamboo fiber to make it breathable and allow air to circulate. These diapers come with thermal regulating and moisture wicking capabilities. These ensure that your baby is comfortable and dry in hot or cold temperatures. It features a wetness indicator that turns green/blue when it’s time to change. It also comes in a 3-D form fitting design to ensure a perfect fit and to reduce the chances of leakage. A lot of customers love this product, and a reviewer even stated it exceeded her expectations. This diaper left her baby with no irritation, and leaves nothing behind once it’s taken off. However, the tapes on this diaper don’t seem to be sticky enough. They can rip off easily and can be difficult to fasten, which is sad because this product is quite expensive. Made from renewable materials, these diapers are highly-absorbent and are breathable. They are also fragrance and chlorine-free, which make them ideal for baby’s sensitive skin. Instead of plastic, this diaper uses a GM-free cornstarch film as its leakage barrier. This makes it more breathable and compostable without sacrificing being watertight and its effectiveness. Not to mention that it has added health benefits yet is equally as effective as plastic. This film even helps keep pathogens and bad bacteria away from the skin. This results to lesser irritations, and more peace of mind that baby is safe from any harmful elements. Hypoallergenic, these diapers are recognized by the Swedish Asthma and Allergy Association. The association only approves of products that can be used by people with such sensitivities. This brand started in 1994 and is leader in eco-friendly products. The founder found the damage caused by disposable diapers alarming, so this product was created as a possible solution. The result is a natural product made from high quality materials for a fraction of the cost. This product is great for baby’s sensitive skin because it is hypoallergenic and absorbent. And when we say absorbent, its extra absorb channels can leave your baby dry for up to 12 hours. This product uses the absorbent gelling material, or AGM, in its padding to make it absorbent. It is completely safe, and is related to ingredients used in food processing and cosmetics. It is also the brand's softest diaper ever, so no amount of friction can harm baby’s delicate skin. time or not. They offer a comfortable fit, so baby can roam around freely with no hesitations. What sets these diapers apart is their contoured umbilical cord notch. This makes it perfect even for newborn babies, to prevent this delicate area from getting irritated. Another thing is its fasteners are sticky. They’re great at keeping diapers stay in place—just make sure they don’t come in contact with baby products so as not to lose their effectiveness. Highly absorbent, these diapers offer superior leak protection to ensure your baby stays dry and protected. It also absorbs thrice as much as a standard wetting as compared to other diapers. These diapers also come with a stretchable waistband and double leg cuffs to effectively prevent leaks. Its core is chlorine-free, making this a good choice for baby’s sensitive skin. It is fragrance-free and is made from sustainable materials to protect your baby and Mother Earth as well. These diapers come with stretchable side panels. It is also easy to have it on and take it off, thanks to its large, refastenable tabs. And have we mentioned that it also offers a comfortable fit? This allows your little explorer to do all the exploring he wants. This may sound childish, but these diapers also come with adorable animal designs. We think having animal prints on your diaper make it cuter and make the experience more worthwhile. Plus, the inks used are lead-free, so there’s really nothing to worry about. For an expecting or a first-time mom, diaper hunting can always be challenging. The same goes for experienced mothers, especially now that there are lots of options to choose from. But there’s no need to fret. Today we present to you 3 important guidelines to narrow down your choices. It’s ability to absorb pee. A cranky baby is usually a sign of a wet baby, and is one of the reasons they cry and get up in the middle of the night. The perfect diaper can quickly absorb pee, take in several wettings, and stay dry for at least 12 hours to allow your precious one to sleep comfortably and continuously. Next is its fit. Remember that there will be a lot of stretching and movements involved, so the diaper you choose must both be stretchable and comfortable at the same time. It should fit perfectly so it doesn’t fall off, but it shouldn’t be too tight either so as not to cause friction and cause irritation. Last is to choose soft materials. If a diaper doesn’t feel soft to your touch, it is most likely not appropriate for baby’s delicate skin as well. Diapers should be soft yet breathable to avoid moisture from building up that can later cause rashes. Skin covered in diapers is usually wet, experiences a lot of friction, and often covered in poop. All these can be a source of irritation. Allow your baby to “air out” as much as possible, and always apply a barrier cream prior to putting a new diaper on. Petroleum jelly can be used as a barrier cream. Barrier creams help prevent baby’s skin from becoming too raw and wet. Since babies can’t communicate the same way an adult does, it is our job as parents to know and give what’s best for them. And in this case, diapers are also something to be considered. We chose the Chlorin﻿e Free Diapers by Earth’s Best as the best diaper for sensitive skin. These diapers are absorbent, breathable, and provide a comfortable fit to reduce rashes and chafing.